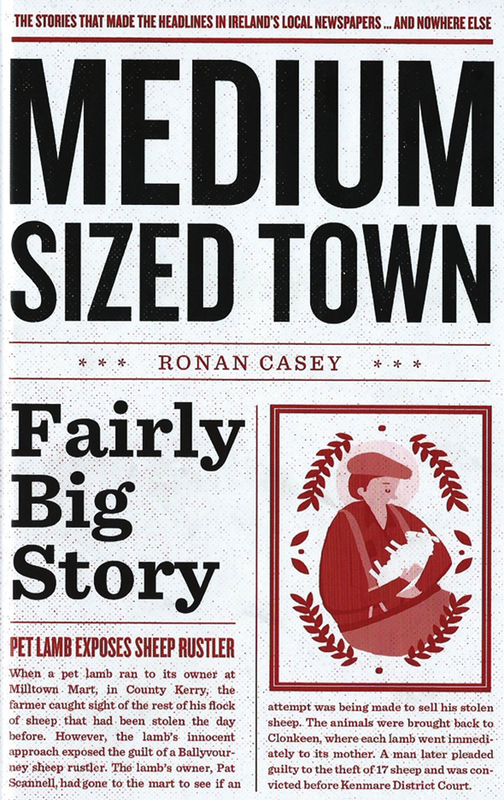 Ronan Casey’s compendium, Medium Sized Town, Fairly Big Story, is classic stocking filler fare, especially if you have a taste for the oddities of small town life. Subtitled ‘The Stories that made the Headlines in Ireland’s Local Newspapers… And Nowhere Else’, the book is a collection of news clippings from newspapers such as The Kerryman, the Anglo-Celt, the Limerick Leader (not to single out any of our fellow institutions: Dublin papers get their moment in the sun too). The clippings are recent, largely recreated in a variety of fonts that (presumably) echo the style of their parent publications, and varying from the inane to the amusing to the laugh-out-loud funny. Some gems that have stood out among the NewsFour journalists include ‘Failure in Attempt to Tunnel into Limerick Prison’, ‘Arsonist sets himself on Fire’ and ‘Thief pulled a pint as he robbed nightclub’. Funny as it is, this is very much a passing fancy of a book: good bathroom reading, or a talking piece to bring to the pub or leave lying around the house. The compiler Ronan Kelly may be known to NewsFour readers as a presence on the TV3 morning show Ireland AM, where he showcases headlines like the ones in this book for morning TV viewers to enjoy over their coffee and cornflakes. All in all, a fun distraction that may while away some hours between The Wizard of Oz and Raiders of the Lost Ark this Christmas.